For more background on this table, check out part 1 here. This table is so cool and I feel like you need to know how cool it is too. So definitely read our first post for all the history:) Our ultimate goal was to totally change the coffee table base and make it even more unique since it came off of a cargo ship! See, cool…right? For a refresher, here is the before and after! East Coast Driftwood Look… How She Did it! I know, I know. This table has taken the internet by storm. How did she do it? How did she get that East Coast Driftwood look? Lol. I may be exaggerating. But, I have gotten more questions about HOW I did this table than any other piece, ever! I will be honest….I don’t know if I could ever 100% duplicate this. But I will share my process! Once upon a time several years ago, we went to this dark and dreary barn that had no lighting and spotted a super cool coffee table with our phone screen lights. This was before everyone had a flash light with their cell phone. The man wanted $200 for it which we could NOT afford. A whole year went by, and we were still talking about this coffee table. So we stopped in again and told ourselves if it was still there that it was meant to be. IT WAS. We recently rescued a coffee table from a salvage place before it hit the dump. SOMEONE WANTED TO THROW THIS AWAY. So we paid the salvage company to save the coffee table! The top was completely busted. We ripped it off and replaced it with 2″ thick oak reclaimed barn wood. This is the real 2″ not the modern 2″. It really makes a statement. Hello and Welcome! 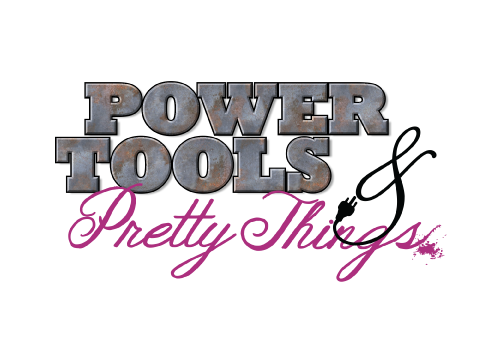 Power Tools & Pretty Things was created as a place for the DIY'ers of the world! Our parent company, Rescued Furnishings is located in St. Louis, MO and we modify kitchens, add moldings, create built ins and even make custom cabinetry and furniture! Feel free to visit us! Any content on this site is created for inspiration purposes only & is for personal use only. Creating with our methods, plans, products or tools is at your own risk. All borrowed content must be linked back and properly credited to Power Tools & Pretty Things. Direct links to any free plans, videos or printables from this site may not be shared. Republishing content in whole or in part without express written permission is prohibited.